Made famous as the birthplace of Charles Darwin’s theories on natural selection and evolution, the Galapagos Islands have one of the highest rates of endemism of any island group in the world. It is here in 1835 that Darwin found a volcanic world, geologically young and always separate from mainland South America, with a proliferation of remarkable flora and fauna. In this isolation Darwin saw similar species - birds, reptiles, mammals and plants - on different islands, adapting to the different habitats. Over the next 20 years his ideas solidified until 1859 and publication of On The Origin of Species, which turned the world on its head. The Galapagos national park, established a century later in 1959, is a UNESCO World Heritage site protecting the nearly 50 islands in the archipelago as well as the surrounding marine reserve. With these protections the Galapagos Islands remain largely unspoiled by development, with 97% of the land preserved as national park. The 3% which is outside of the park includes communities on parts of Santa Cruz, San Cristobal, Isabela, Floreana and Baltra Islands. Further restrictions from the national park control the number of vessels in Galapagos, as well as their size, where they may go, and where we may go as visitors. Today there are 30ish resident land bird species in Galápagos (the exact number keeps changing with new DNA research), including 25 endemic species, and an additional 4 who are endemic at the level of sub-species. There are 7 endemic Sea Bird species in Galápagos, plus an additional 14 native species, and a wide range of vagrants or occasional visitors..
Because of the national park restrictions/protections it is critical to select a yacht and itinerary that will get you to the best islands and visitor sites to really see the diversity found in Galapagos. As with all of our Galapagos expeditions, whether natural history workshops, photo tours, or birding tours, we are traveling via a very comfortable 16-passenger motor yacht, with longer sailings at night and shorter island hops during the day, often visiting areas only accessible to smaller boats. Our itinerary and routing ensures us enough time at each location to experience it fully, including lingering as we watch for some of the harder to find species. 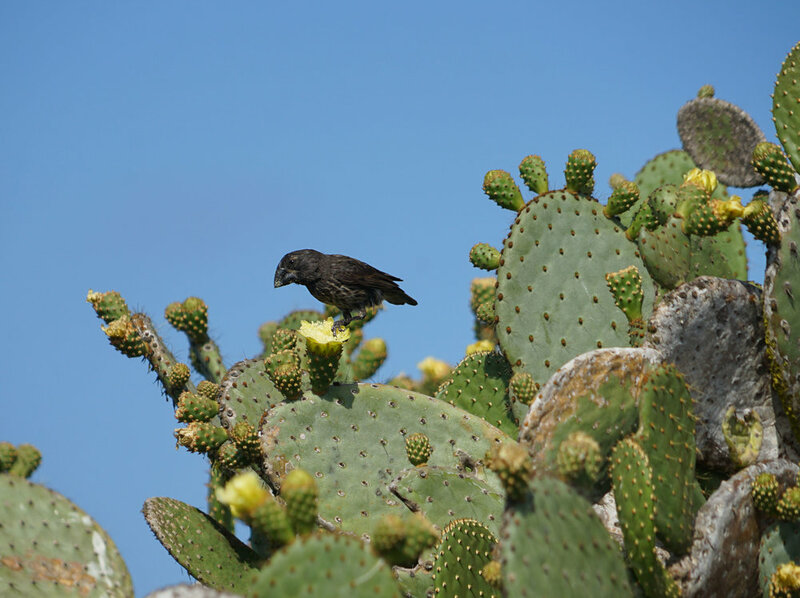 Not that most species in Galapagos are hard to find! This gives us a very real opportunity to find all of the islands’ accessible birds and reptiles. Our Galapagos Birding itinerary follows the same routing as our standard natural history workshops; 11-days on board the yacht, visiting the same islands. The difference is in the leadership and focus on birding, and taking the time to try and find several of the hard to see species. Our itinerary - the places we go - is key to your success. A remarkable number of species are range restricted to a single island! For example three of the mockingbird species are unique to single islands, while the 4th mockingbird is more widely distributed. Waved albatross are found on a single island: Espanola. Same with the medium tree finch, found only in the highlands of Floreana. Other species, like the red-footed booby, are found on several islands, but at only a couple of accessible visitor sites. Or flightless cormorants, or Galapagos penguins, or Galapagos martins - you have to go where park visitor sites and their habitats converge. It is critical to go north to Tower Island, west to Isabela and Fernandina, and south to Espanola, Floreana and San Cristobal. We do that, and more. We will make every attempt to find all of the Galapagos endemics (short of the Mangrove Finch, which does not occur near any park visitor sites). Our specialized birding tours are led by the husband and wife team of Elizabeth Coral De Backer and Etienne De Backer. Ely was born and raised in Guayaquil, Ecuador. In 1980, following college, she moved to the Galápagos Islands where she has made her ever since home. Originally working with the Galápagos National Park in the introduced plant eradication programs, she later worked at the Charles Darwin Research Station accompanying herpetologists, ornithologist and botanists in their field work. She began guiding in 1982. With a doctorate in biology, ET left his native Belgium while in his mid-30’s to explore the world. Seven continents later he arrived in the Galapagos (in 1985) where he met Ely and settled down. Since that time he has been a licensed naturalist guide and expedition leader in Galapagos and mainland Ecuador. With a combined 70 years of experience guiding in the Galapagos it would be hard to find a more knowledgeable team to show you “their islands” and the extraordinary flora and fauna found there. Together ET and Ely recently recently published Galapagos Birdwatching – photographic Identification (the eBook is available on Amazon).